Mechanicsburg’s Noah Wolf makes a jumping catch near the warning track against Northeastern on Thursday. Mechanicsburg’s Macy Reed smashes a ball back up the middle against Northeastern on Thursday. 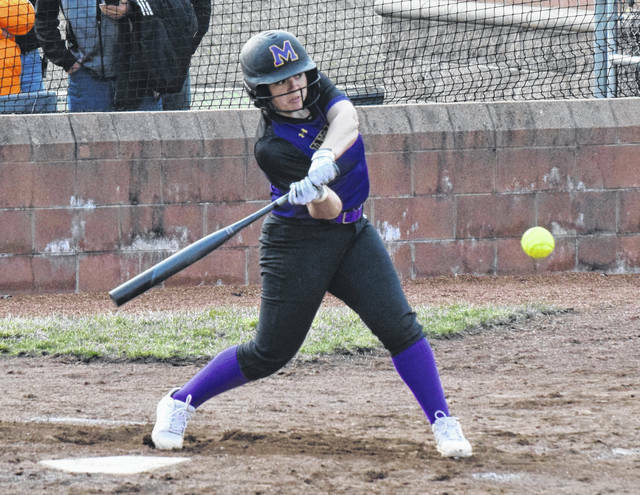 MECHANICSBURG – Mechanicsburg grabbed an early lead and rolled to a 15-0 win over Northeastern in OHC softball on Thursday. The Indians led, 6-0, after two innings and continued to pound the Jets until the run rule ended the contest early. For Mechanicsburg, Daytayviah Rodgers was 2-for-2 with a home run, a double and 2 RBI. Audrey Ayars was 2-for-4 with a pair of doubles and 2 RBI, Mallory Blakeman was 2-for-3 with a triple and 4 RBI, Hanna DeLong was 3-for-4 with a double and an RBI and Taylor Hurst was 2-for-2 with a double and an RBI. Megan Alspaugh was 2-for-4 with an RBI, Macy Reed was 2-for-4 with an RBI and Francys King was 1-for-2 with an RBI. King struck out seven in her four-plus innings of work and allowed three hits. Mechanicsburg (1-1, 1-0 OHC) travels to West Liberty-Salem on Monday for a key conference matchup. 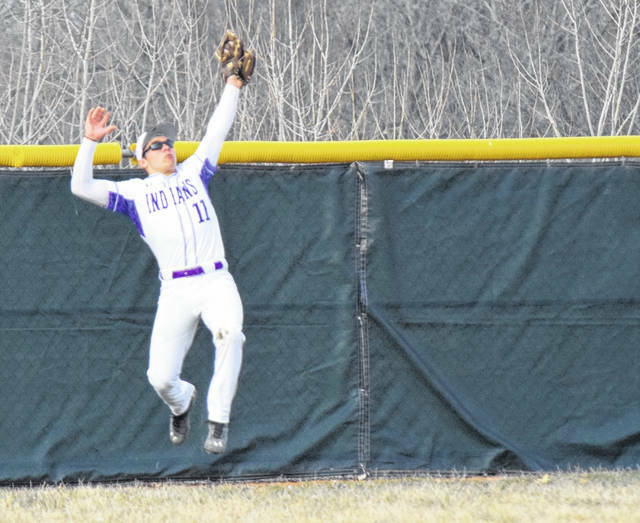 MECHANICSBURG — Mechanicsburg and Northeastern battled to a 9-9 tie going into the eighth inning before darkness took over Thursday in OHC baseball. “Our kids didn’t stop fighting. We battled back a few times,” MHS Coach Bryan Eyink said. The Jets took a 7-3 lead after two, but Mechanicsburg was able to wiggle back into the game and keep it dead even. The game will be finished when the Indians travel to Northeastern. The Mechanicsburg jayvees won, 7-3. WEST JEFFERSON – West Liberty-Salem varsity softball lost to West Jefferson on Thursday by a score of 1-0 in OHC action. The Roughriders scratched across a run in the first inning and held on. Kelsey Day took the loss for the Tigers. For WL-S (2-2, 0-1), Camrin Rice was 2-for-3, Aubrey Williams was 1-for-3 and Arrah Sandy was 1-for-1. NORTH LEWISBURG – Triad defeated Fairbanks, 7-5, in OHC softball on Thursday. The Cardinals opened with three runs in the first inning and never looked back. For Triad, Ali Cox was 3-for-4, Kendell Hughes was 2-for-3 with a double and 3 RBI, Joni Russell doubled and Gracie Sheets was 2-for-3 with a double. Triad (1-0, 1-0 OHC) goes to Greenville on Saturday for a doubleheader. PIQUA – Urbana lost to Piqua, 13-9, in non-league softball on Thursday. The Hillclimbers out-hit the Indians and came back from a 10-1 deficit. “We fought back, which is something positive,” Urbana Coach Aaron Pittsenbarger said. For UHS, Emily Skelley went 3-for-4 with a double and an RBI, Mara Donohoe was 3-for-4 with a double and 2 RBI, Gracie Hower was 2-for-4 with 2 RBI and Maleah Murphy was 1-for-4 with an RBI. Urbana (0-2) is scheduled to host Bellefontaine today before dueling with Stebbins on Saturday. https://www.urbanacitizen.com/wp-content/uploads/sites/36/2019/03/web1_NoahWolf032819.jpgMechanicsburg’s Noah Wolf makes a jumping catch near the warning track against Northeastern on Thursday. https://www.urbanacitizen.com/wp-content/uploads/sites/36/2019/03/web1_MacyReed032819.jpgMechanicsburg’s Macy Reed smashes a ball back up the middle against Northeastern on Thursday.